Anita was diagnosed with Asperger's syndrome (a mild form of autism) at age 50. She is the author of The Complete Guide to Autism & Healthcare (Future Horizons). Autism traits become more apparent as girls reach adolescence but stay stable in boys, according to work presented at the 2017 International Meeting for Autism Research which was held in San Francisco, CA. These findings may explain why girls with autism tend to be diagnosed later in life than boys. According to Spectrum (which is funded by Simons Foundation Autism Research Initiative - SFARI), “Girls with autism are known to be good at learning to mask their autism traits.” Dr. Tony Attwood, a world-renowned autism expert, has said that many girls “fake it ‘til they make it.” There have been some studies that have pointed to the fact that behaviors in girls are less obvious, and therefore misdiagnosis or late diagnosis is more prevalent. It is true that a higher percentage of boys are diagnosed. Recent monitoring by the CDC (Centers for Disease Control: Autism and Developmental Disabilities Monitoring) shows that autism spectrum disorder (ASD) is almost five times more likely to be identified in boys than in girls. But these studies look at children based on data collected from the health and special education records of 8-year old children. Better support is needed for those women diagnosed in their late teens and into adulthood. Myrna Beth Haskell, managing editor, spoke with Anita about her journey with Asperger’s Syndrome (before and after her diagnosis) and her mission to educate the medical community about how to provide better health care to those on the spectrum. You were not diagnosed until the age of 50. Tell me what it was like to be diagnosed as an adult and did this diagnosis help you in any way? It never ends. It’s an ongoing process your whole life – a lifelong evolution. Growing up, I had no idea. My mother never had me evaluated for anything. My mom and I were best friends. She passed away several years ago, but we were alike in many ways. She would just say things like, ‘The apple doesn’t fall far from the tree.’ My mom never had friends – it was just always the two of us together. She just believed she was an odd duck artist. I’m sure that if she had been tested, she would have been diagnosed as well. It all became clear to me when a coworker’s son had been diagnosed with Asperger’s, and she shared some information with me at work right after she had learned about it. When I started reading all of this stuff, I realized I had it, too. Then, at the age of 50, I was formally diagnosed by a neuropsychologist. Everything started to make sense once I learned more about autism. Looking back…I never really fit in, but I started to blossom once I got into college. I had many sensory issues, like being hyperaware of scratchy clothing, and I also had a lot of anxiety. I thought that I was the only one experiencing these problems. Now that I realize there are so many others feeling this same way and there are things I can do about it, it’s a relief. I’ve learned to tone down my anxiety – to better step outside of things and to look at situations from a different perspective. After I learned I was on the spectrum, I could deal better with the things that used to upset me. Many girls and women are diagnosed late or misdiagnosed as children. Why do you think this is? I think that females are more inclined to be able to talk more. In other words, they’re more social than boys. However, for me, I didn’t try to act differently or to be someone I’m not. Could you tell me what it’s like to work in such a high-pressured job? Were there any particular obstacles that you had to overcome due to being on the autism spectrum? Well, there are some good things about my neurology that help me with my job. I have an ability for extreme focus and enjoy working on more complex cases that others might shy away from. I’m able to do mental check lists, to plan ahead, and because I was so intrigued by neurosurgery, I would delve into reading about difficult cases. I also love to work with my hands, so epidurals, spinals, and arterial line placement are easy for me; plus, I enjoy it. But I had other problems at work that had nothing to do with my skills. I didn’t fit in well with my coworkers. My performance was great, but I was having social issues. I would say or do something that would irritate others. I was bullied by two people at work and was on the verge of being fired. I would report that I was having issues, and then I became the problem. Then, CARD (Center for Autism Related Disorders) got involved. They have this service where they’ll go into the school or workplace of someone who is having issues and educate the staff or employer so that coworkers can become more knowledgeable about behaviors of those on the spectrum. My employer was very receptive about working with CARD. I also learned a lot in this process. For instance, someone said, ‘It irritates me that she goes off somewhere for lunch all by herself. She’s not a team player.’ They needed to hear that this was my way of decompressing. My search engines would need cooling down. The operating room can be a crazy circus – a sensory overload. Once they understood my behavior, things calmed way down and got much better. What advice would you like to share with other women who have been diagnosed with autism in adulthood? Don’t focus on your diagnosis. Learn about it, but then help yourself overcome it. Get out there and do the stuff that excites you – a hobby, taking classes, your job. I would love to hear more about your book The Complete Guide to Autism & Healthcare. What are some specific issues that the medical community needs to know in terms of treating those on the spectrum? Before I was diagnosed and I had to go to doctor appointments, I recognized that these people often looked at me like I was from another planet. They just didn’t understand me. My husband is also on the spectrum, and he feels the same way. Those on the spectrum often avoid seeking medical help because they are disrespected and marginalized. I’m on both sides of this issue, so I can be the bridge that better connects the autistic community and medical providers. One of the main problems is that a lot of healthcare providers just don’t know a lot about autism. A big issue is communication. For instance, a healthcare professional can text an autistic patient, instead of talking to them, to get them to open up. Sensory overload can be a big stressor. The waiting room with its bright lights, crowds, noises and smells (numerous colognes people are wearing, disinfectant, etc.) can cause the autistic patient to be frazzled before they even leave the waiting room. Then, they see a doctor who might not explain what he’s going to do or why before touching the patient. Ultimately, the doctor has no idea about why the patient becomes upset or how to handle an imminent, sensory overload meltdown. Click book cover for excerpt. Anita’s book covers everything from preparing an autistic patient for an exam, to an autistic’s abnormal response to pain. Anesthesia, in particular, can be difficult to administer to an autistic person. Can you explain? More healthcare providers need to be educated about this. Anesthesia for an autistic can be more profound. It can take longer to metabolize. For a very small percentage, there can be very negative outcomes. A subset of children with ASD has abnormal mitochondrial energy production and function. For most, there are some very simple adjustments that can be extremely helpful. There are some basic steps that can be taken which make a big difference, such as minimizing sensory overload, checking for allergies, and scheduling ASD patients first to minimize wait time. Parents should also communicate typical stressors for their child and what has worked best for their child in the past. Being home with my husband and animals. We have many animals, including two horses, but I rescued this cat with two inch legs,* and she is the best animal I have ever had in my life. She goes everywhere with us. She provides emotional support. *Anita’s cat had suffered an electrical shock and fell from a utility pole. Anita Lesko is an internationally recognized autism advocate and member of Autism Society of America’s Panel of Autistic Advisors. She graduated from Columbia University with a Master of Science degree in nurse anesthesia and now specializes in anesthesia for neurosurgery. She was recently diagnosed with Asperger’s Syndrome at the age of fifty. ​Anita is a contributing author for numerous publications including the Autism Asperger’s Digest and The Mighty. She is a blogger for the International Board of Credentialing and Continuing Education Standards. Anita’s memoir titled Asperger’s Syndrome: When Life Hands You Lemons, Make Lemonade (iUniverse, 2015) was written immediately after she was diagnosed. She co-authored Been There. Done That. Try This! The Aspie’s Guide to Life on Earth (Jessica Kingsley Publishers, 2014) with Dr. Tony Attwood and Craig Evans. She combined her personal experience of living on the spectrum and thirty years of experience as a medical professional to write the book The Complete Guide to Autism & Healthcare (Future Horizons, 2017),* which educates healthcare providers about autism and how to best communicate with individuals on the spectrum in order to provide quality care to this rapidly growing population. 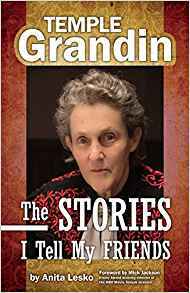 Anita spent hours interviewing her close friend, Temple Grandin, for her latest book, Temple Grandin: The Stories I Tell My Friends (Future Horizons, 2018), which provides a personal perspective and unique look into the mind and life of Dr. Temple Grandin (see our interview with Dr. Grandin HERE). Anita was a speaker at the United Nations Headquarters for World Autism Awareness Day in April 2017. She continues to work full-time as an anesthetist while working tirelessly as an autism advocate. Her ultimate goal is to change the world’s view of autism, enabling all on the autism spectrum to lead happy and productive lives. *This book is excerpted HERE in Sanctuary. Click book cover to purchase.